This October we passed the one year mark of driving two electric vehicles (EVs). Now is a good time to take stock of how many miles we drove on electricity in 2016-2017. During the year we drove a leased Nissan Leaf, a battery electric vehicle (EV), and a Chevy Volt, an extended range EV. We drove a total of 9,000 miles for the period, far less than the typical North American family of 12,000 to 13,000 miles per year. My wife, Nancy Nies, is retired and I work at home. My commute is from the kitchen to my desk. Of the 9,000 miles, we drove nearly 6,000 miles on electricity. The remaining one-third of the miles we drove on the Volt's gasoline engine on trips where there are no charging stations, not even Level 2s. For the 12 months from October to October we consumed nearly 1,800 kWh about equally split between two vehicles. 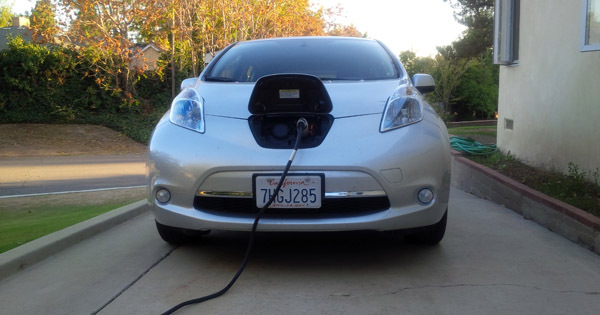 Charging the EVs accounted for 30% of our 5,900 kWh of household consumption. The addition of the second EV, the Volt, pushed our electricity consumption above the "baseline" for our region of California of 4,900 kWh per year by 1,000 kWh. Consumption above the baseline pushed us into the second tariff tier on several occasions, increasing our average cost of electricity over that of previous years. The gross mileage, miles driven relative to consumption at the wall meter, was 3.9 miles per kWh for the Leaf and 2.8 miles per kWh for the Volt. Based on our experience we can assume that the mileage of battery EVs at the wall will range from 3.5 miles per kWh to 4.0 miles per kWh. At an electricity cost of $0.20 per kWh, an EV will cost about $60 to drive 1,000 miles or from $500 to $600 to drive 10,000 miles per year. As noted, we drove the Volt to areas where there were no charge stations. For us that's typically on the eastern side of the Sierra Nevada's. We hope the situation will eventually change, but with the exception of Tesla there's not much movement to provide charging there even now. Nearly 50% of the 5,800 miles we drove the Volt were driven on electricity. We used 84 gallons of gasoline to drive the Volt 3,100 miles for 37 mpg on the gasoline engine. However, the total gasoline mileage of the Volt for the period was 69 mpg. We are the Volt's second owner. The historical gasoline mileage of the 2013 Volt with 40,000 miles on the odometer is 87.5 mpg. I've written previously about our consumption after the first quarter of driving two EVs. 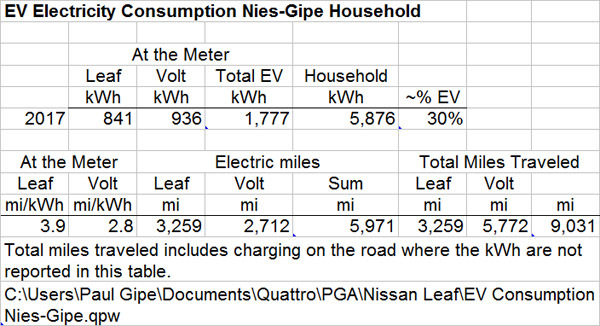 See EV Electricity Consumption in All EV Gipe-Nies Household.